We are shining a light on the past to foster a deeper understanding of the world’s heritage and develop new ways to protect, preserve and promote it. Heritage is all around us and plays an integral part in our sense of identity and culture, but it is under threat from mass tourism and climate change as well as man-made and natural disasters. Our research ranges from prehistoric cave art and the ancient civilisations of Egypt and the Middle East, to the cusp of the modern world. We work in areas affected by natural disasters and human conflict to help protect cultural heritage for future generations. We investigate and record early drama and song, and develop new ways to understand how some of the oldest books and manuscripts were made and used. Closer to home, we draw inspiration from our position within Durham’s monumental UNESCO World Heritage Site, attracting researchers and students from across the globe to our unique collections, archives and living heritage. Our interests stretch across the world, unbounded by time or place, to help ensure the preservation of the past, for the future. 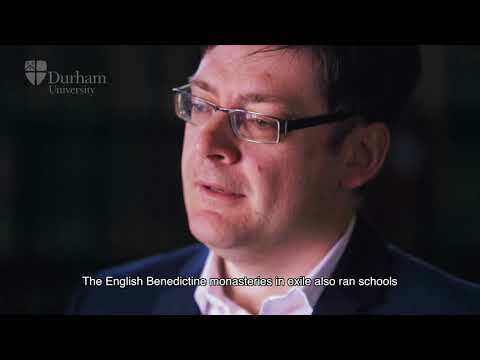 Dr James Kelly discusses the Monks in Motion research project which has investigated the role and influence of English and Welsh Benedictine monks during their exile in Europe from 1553-1800.